The Bean Bag Hammock by the Two Knots Hammock Company combines the ergonomic comfort of a hammock with the plush feel of a bean bag chair. The hammock is essentially a two-layer hammock featuring a plush faux-fur “polar bear” liner and a jean canvas fabric outer. A short zipper near one end reveals the inside that contains 15 gallons of small polyester “beans”. The hammock is gathered at the ends using a simple whipping method and a Lark’s Head knot and is made in the heart of hammock country: Nicaragua. 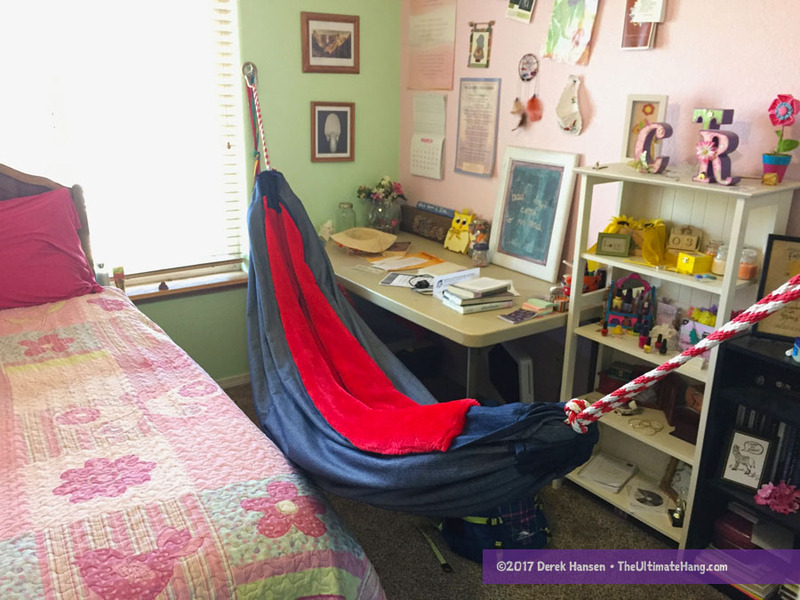 This is a really fun hammock, and it’s won over my kids to the point of being permanently fixed in my daughter’s bedroom. She loves to lounge in it, read books, and do homework (at least I think that’s what she’s doing). The hammock is very comfortable and works great for lounging and sleeping indoors. The polyester fill works great as an insulator and it actually gets a little too hot at times when sleeping that I’ve been tempted to take it outdoors. The plush “polar bear” faux fir liner is soft and comfortable. I was surprised about how the ends of the hammock are constructed. Instead of sewing an end channel, the fabric is gathered up and the rope loop is tied with a Lark’s Head on the end. After a few days of testing, I noticed the rope was slipping down the fabric and nearly came off. After adjusting the rope further down the fabric, it still slipped. The hammock loses a lot of length with this whipping method, plus I was worried about a suspension failure, so I went ahead and sewed channels on the ends. This saved some fabric length and gave me a more secure connection point for the end loop. If there is one change I would recommend it would be for the company to sew end loops for the rope. Aesthetically, the hammock has very few visible flaws. The stitching is good and the finished product is well done. However, the jean canvas appears to be sewn wrong-side out. The deep blue, in my book, is the outward-facing side of the fabci, but it is on the wrong side. I think the hammock would have a much cleaner look with the dark side facing out. I sewed end channels, not only to get more length on the hammock, but to prevent the rope from sliding off. Suspension and Anchor System ♥ ♥ ♥ ♥ ♥ The end loops need to be re-worked so it doesn’t slip. Construction and Craftsmanship ♥ ♥ ♥ ♥ ♥ Good construction and materials used. Modularity ♥ ♥ ♥ ♥ ♥ Lots of options, although best used indoors or around the home. Price and Value ♥ ♥ ♥ ♥ ♥ A good-quality, large bean bag chair ranges anywhere from US$100 to $200, but has more fill than the hammock. I think the price is little high, but within the ball park. Thanks for the review of our hammock! So why knots instead of a sewn sleeve? A gathered end is stronger than a sewn sleeve. Each hole the needle makes to sew a sleeve weakens that part of the hammock…we actually had rip during test of earlier models. We really appreciate the honest feedback and our designs are constantly improving. For instance we just constructed a microfiber model that looks more sleek and stays cooler. Thanks for the honest review, Derek! I love your site and am glad to hear your daughter likes the hammock. Thanks Casey! Glad to hear about the improvements. We sure love the hammock.